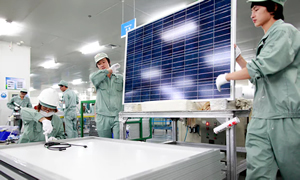 Arthur Neslen for The Guardian: Europe’s solar industry has condemned an EU vote to impose another round of duties on Chinese imports, just weeks before a US trade panel is due to rule on similar tariffs. A Brussels committee yesterday agreed to set minimum import duties for Chinese solar modules and cells that could price them up to 30% above market levels with “huge negative effects” for the industry, according to trade groups. There is also a “99% probability” that Trump will announce tariffs on Chinese solar imports before the end of January, according to one source who has held talks with senior US government officials. European commission sources insist the EU’s anti-dumping measure will slowly reduce existing tariffs and “gradually lead to a convergence of the world market price and the EU import price”.